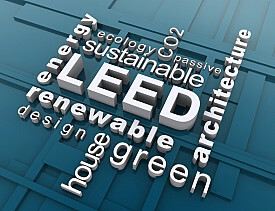 Is LEED leading the way to sustainability and energy efficiency? Critics increasingly say "no," but alternative green construction and remodeling standards exist, and some provide more useful guidance and stringent rules. The U.S. Green Building Council developed the Leadership in Energy and Environmental Design, or LEED, standards as a way to get independent ratings and verification of environmental claims. The standards can help builders and remodelers identify and quantify the sustainability of their buildings. The LEED standards cover energy savings, water efficiency, greenhouse-gas emissions, indoor environmental quality, and stewardship of resources. Various standards apply to new construction, ongoing operations and remodeling. There is also a neighborhood standard that helps communities minimize their environmental footprint. LEED's platinum, gold and silver ratings are the most famous and widely advertised independent measure of sustainability. Contractors and manufacturers are keen to advertise that their products and services contribute to LEED ratings, and companies with LEED-approved facilities wear the rating as a badge of green credibility. However, the badge has been tarnished by Henry Gifford, a New York City mechanical systems designer, who crunched the numbers behind a USGBC study that found LEED buildings are only 25 to 30 percent more efficient than the average building. Others have long complained that the LEED process is expensive and cumbersome. • Green Globes: The Green Building Initiative developed Green Globes as a cheaper, simpler Web-based alternative to LEED. The standards are fairly similar, but Green Globes is primarily focused on energy efficiency rather than some of the product sourcing criteria in LEED. Green Globes also is more flexible than LEED, and allows a greater degree of self-reporting. This also makes it too weak, according to some critics. • NAHBGreen: The National Association of Homebuilders created a residential sustainability certification program. It is quite similar to LEED, although substantially less expensive in some ways. The program is also less stringent about testing energy performance, so NAHBGreen homes could potentially be less efficient than LEED homes. • Energy Star: The little Energy Star logo on your refrigerator is also available for buildings. More than 1 million homes are Energy Star certified, which requires an ongoing review of year-round utility bills. The building must be quantifiably more energy-efficient than the average home. This type of Energy Star certification is a requirement for a certain level of LEED Operations and Maintenance rating. However, you can permanently affix a LEED New Construction certification plaque to your new building based on a single measurement. You don't need to track energy use over time or in different seasons. • Living Building Challenge: The International Living Building Institute is far more stringent than Energy Star or LEED. So far, three buildings are certified to the Living Building Challenge standard. The rating goes far beyond requiring lower energy usage. A Living Building must produce at least as much energy as it uses. There is also a wide array of other requirements. For example, all water used must be captured and treated, the site must incorporate urban agriculture, and the building must be completely non-toxic. The list goes on, and includes social and environmental justice requirements, as well as education measures. While LEED projects get points for certain features while glossing over other requirements, the Living Building rules look at the whole package and don't allow much wiggle room. • PassivHaus: We previously covered the other über-strict green building system, the German PassivHaus, or Passive House, rating. It is designed to cut energy use by 90 percent. It has none of the other requirements of a Living Building. The Passive House is all about energy consumption, or the lack thereof. If you want a certifiably sustainable building, you may want to look beyond the questionable LEED certification program to the Living Building and Passive House standards. Building a Garden Pond – DIY or Not?